The story of Luis is a good example of the benefits of engaging parents and families. A simple home visit by the teacher revealed how, previously unbeknownst to the school, a young ESL student was connecting his tutoring and schoolwork with his family. In turn, Luis' family was most appreciative of their son's progress in school and welcomed his newly gained English skills that were helping them learn. Families living in poverty often work multiple jobs, may have limited English language skills, and in some cases may have had few positive experiences with their children's teachers or schools. These factors frequently work against a school's attempts to form relationships with families living in poverty and authentically engage them in their children's education. Even in high-performing schools, this problem is an ongoing concern. Leaders in high-performing, high-poverty (HP/HP) schools continually look for ways to provide opportunities for involvement and to gain back their trust. In a recent study of public schools in Chicago, Anthony Bryk, president of the Carnegie Foundation for the Advancement of Teaching, and his colleagues concluded, "Relationships are the lifeblood of activity in a school community" (Bryk, Bender Sebring, Allensworth, Luppescu, & Easton, 2010, p.137). In one high-poverty elementary school, a teacher remarked, "Without a trusting environment in our classroom and with the families of my kids, it's all uphill. We never make the progress we could. . . we never can 'click.' Trust is what makes it all happen for us." The development of trusting relationships lies at the heart of successfully engaging parents, families, and the community. Here are seven strategies and practices to build trust between schools, students, and families. Many HP/HP schools connect vital social and medical services with their students. These full-service schools typically provide services such as social workers, physicians, dentists, vision and hearing specialists, grief counselors, and family counselors on site. 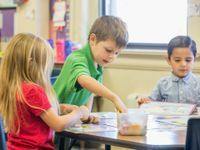 Some schools provide a childcare center, a family resource center, or hunger/homelessness support to assist families in meeting their basic needs. Research shows that when a full-service school works well, student achievement increases, attendance rates go up, suspensions drop, and special education placements decrease (Dryfoos, 1994; Dryfoos & Maguire, 2002). Many HP/HP schools operate their own programs with local staff and volunteers; others access the help of Big Brother/Big Sister programs, local YMCA/YWCA services, and a host of other community-affiliated programs that offer adult mentoring. Community-based learning also provides an excellent means to initiate career exploration, internships, shadowing, and jobs. Many HP/HP schools encourage and conduct some form of home visits. Fourteen years ago, test scores in the Mason County School District ranked in the lowest quartile of all districts in Kentucky. Inspired by the idea of building closer connections to students' home lives, the district, with a cadre of volunteer teachers, embarked on a goal of visiting every home of the 2,800 kids enrolled. Maintaining this commitment over the years, together with positive administrative and collegial support and the requisite professional development, has resulted in every family receiving at least one home visit annually from their child's teacher. The district has experienced consecutive years of student achievement growth and a 50-percent drop in discipline referrals, as well as reduced achievement gaps and increased attendance. We know that a "whatever it takes" attitude prevails in HP/HP schools. This is especially true in their efforts to communicate with the parents and families. Despite often-limited resources, educators in these schools make it a priority to develop authentic connections with students' parents and families. The goal of fostering two-way communication between school and home requires school leaders to be relentless in their insistence that communications be respectful, honest, and timely. Principals, working with teacher-leaders and staff leaders from various vantage points within the school, are positioned to address the wide spectrum of environmental needs that confront high-poverty schools. HP/HP school principals can take a variety of actions (PDF) that will surround every student with the positive supports and scaffolds necessary to ensure his or her individual success. Monitor data to ensure a safe learning environment. Are we making sure that every student is always safe? Build a common understanding of how poverty impacts learning. Do we all understand how living in poverty may negatively influence the ability of our underachieving students to catch up? Plan for mobility. Are we ready for mobile students' arrival -- providing welcome packets, diagnostic testing, and appropriate placements? Do we develop "catch-up" plans if needed? Do we provide built-in opportunities for new friendships with peers? Do we make it a practice to communicate with parents during the first six weeks after enrollment? Do we address transportation issues if a student is mobile within our district? Make sure that all students are connected to a caring adult. Do we know which students come to school without the support of a caring adult? Start student advisories. Is every secondary student connected to an adult at school who regularly monitors his or her progress? Personalize relationships through small learning environments. Is the size of our school presenting problems for some students and preventing us from forming caring relationships? Work to engage every family with school. Do we have a plan in place for guiding our efforts to build trust and connect with our families? Initiate an effective mentoring program. How are we connecting students with caring adults and positive role models? Billig, S. (2000a). Educator's guide to collecting and using data: Conducting surveys. Denver, CO: RMC Research Corp.
Billig, S. (2000b). Profiles of success: Engaging young people's hearts and minds through service-learning. Berkeley, CA: Grantmaker Forum on Community & National Service. Bryk, A.S., Bender Sebring, P., Allensworth, E., Luppescu, S., & Easton, J.Q. (2010). Organizing schools for improvement: Lessons from Chicago. Chicago: University of Chicago Press. Dryfoos, J.G. (1994). Full-service schools: A revolution in health and social service for children, youth, and families. San Francisco: Jossey-Bass. Dryfoos, J.G., & Maguire, S. (2002). Inside full-service community schools. Thousand Oaks, CA: Corwin. Jackson, Y. (2002). "Mentoring for delinquent children: An outcome study with young adolescent children." Journal of Youth and Adolescence, 31(2), pp.115-122. Sadowski, M. (Ed.). (2004). Teaching immigrant and second-language students. Cambridge, MA: Harvard University Press.